The global economic recession of 2008-09 resulted in a significant decline in demand for resource circulation equipment. However, an upturn in end user markets since 2010 has enabled the global resource circulation equipment market to witness a steady rise in demand, states Transparency Market Research in its latest report. Titled “Resource Circulation Equipment Market - Global Industry Analysis, Size, Share, Growth, Trends, and Forecast 2013 - 2019”, the report indicates that developing at a steady CAGR of 7.50% from 2013 to 2019, the global resource circulation equipment market is estimated to grow from a value of US$10.7 bn in 2012 to US$17.6 bn by 2019. The report identifies the key factors driving and restraining the resource circulation equipment market. Significant growth in construction and industrial waste, government incentives and funding, shrinking available area for landfill, upcoming recycling facilities, and escalating need for solutions to reduce the industrial carbon footprint have all contributed towards the development of the resource circulation equipment market. 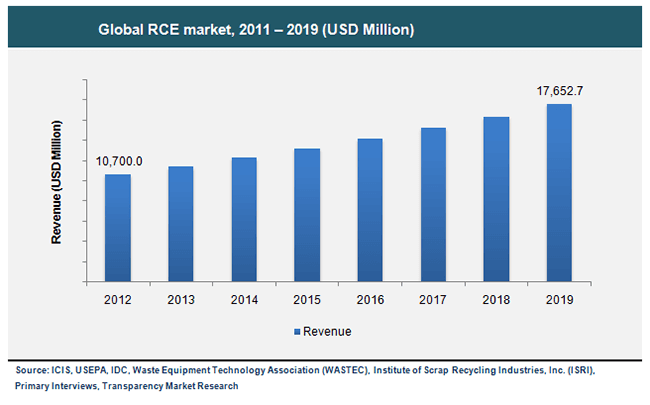 In contrast, high initial investment cost and high market prices of recycled products threaten to hamper the growth of the resource circulation equipment market. On the basis of application, the resource circulation equipment market is segmented into construction, paper, metal, agriculture, automotive, electrical and electronics, plastic and polymer, oil and gas, medical, and others. Accounting for a share of more than 20.0% in 2012, the electrical and electronics segment dominated the resource circulation equipment market in terms of revenue. This segment is driven by the growing trend of recycling in the electrical and electronics industry. On the basis of geography, the global resource circulation equipment market is divided into Asia Pacific, Europe, North America, and Rest of the World. North America and Europe are both leading markets for resource circulation equipment owing to stringent government and environmental regulations. In 2012, North America dominated the overall market with a 39.0% share in terms of revenue. Stringent government regulations and increasing electronic and industrial waste fuels the resource circulation equipment market in North America. The Asia Pacific market, on the other hand, is driven by the increasing focus on recycling activities. The research report identifies key players within the resource circulation equipment market and assesses their performance to give clients a 360-degree perspective of the competitive landscape. The leading companies featured in the global resource circulation equipment market report are ECO Green Equipment, Alfagy, Metso, Zhejiang Feida, Foster Wheeler, ShowaDenko, Clean Burn Inc., VTT, ThermoSelect SA, Kawasaki Heavy Industries Ltd., Vecoplan AG, We Care Organics, JFE Engineering Corporation, Komptech GmBH, Wolf Material Handling Systems, and Lurgi AG. These players are profiled based on attributes such as company overview, business strategy, product portfolio, recent developments, financial overview, and SWOT analysis.